On February 11, 2015, California's Assembly Education Committee held a hearing on the future of the state role in K-12 public school facilities funding. Currently, this future is somewhat up in the air: there currently is no money indentified and Gov. Brown has said he is strongly opposed to going the traditional route of statewide general obligation bonds because it adds to the state's debt burden. However, the CBIA and CASH have joined forces to get a statewide ballot initiative going and there are two bills (Lui; Holden) in the legislature this session on the topic. Here at CC+S we've done alot of research to inform this debate. And we will continue to do so. Here's my presentation to the Committee yesterday - detailing our findings to date, pointing to legal cases on the state's responsbility for facilities, and laying out the 5 guiding principles that we believe should be the roadmap for policy and funding decisions. Good afternoon committee members and chair. Thank you for inviting me. I am Jeff Vincent, Deputy Director and Researcher at UC Berkeley’s Center for Cities + Schools. I have spent over 10 years studying issues of K-12 school facilities policies, planning, and funding in CA and across the country – including looking at how every other state in the country funds K-12 school facilities. Much of my comments today are drawn from our January 2015 paper, Guided by Principles: Shaping the State of California’s Role in K-12 Public School Facility Funding - undertaken with you as the primary audience: those in Sacramento debating the state’s role going forward in K-12 school facilities funding. As we’ve observed this debate unfold in recent months, we realized that shared principles were absent from the discussion – yet sorely needed to guide policy and funding decisions. Here we took a cue from Stanford Professor and current SBE chair, Michael Kirst, who outlined the principles that shaped what was to become the Local Control Funding Formula (LCFF). Today, I will discuss what we see as the state’s responsibility in this area and present to you 5 principles that, we believe, should be the roadmap for the discussion about the State of CA’s role in school facilities funding. These principles are drawn from our analysis of the data on California’s school districts and our research on best practices and approaches by other states. We ask: What are fair, responsible options to advance the state’s interest in promoting quality education, keeping children safe, and wisely using limited public dollars? This is a complex issue – local revenue capacity, previous facility effort, and current facility conditions vary widely. But if we keep these differences in mind, we can figure out responsible approach. The public HAS to spend money every year on school facilities. We simply cannot ignore this need – doing so poses health and safety risks. The absolute minimum standard best practice noted by researchers and building professionals is that 2-4% of a buildings current replacement value is required every year just to keep it in good working order (basic maintenance and repair). Of course, on top of this are occasional significant modernizations (especially to support 21st century learning) and new construction needs (especially when there is enrollment growth). To this point, our research suggests that across California, there is a long-standing, chronic annual underinvestment in existing K-12 school facilities in many school districts. In allowing this to continue we are creating a wall of decay - we are jeopardizing student health and safety, not providing 21st century learning environments for all students, and increasing our facility costs for the long haul. We simply have not committed to the cost of ownership of these public buildings. What is the state’s responsibility for school facilities? Two cases in particular point to the fact that school facilities are an essential component of equal educational opportunity. One is Williams v. State of California (filed in 2000), which focused on gross disparities in school facility conditions and overcrowding. In settling the case in 2004, the State recognized the critical importance of facilities that are “clean, safe, and functional” - this is now in the Education Code (17002) as the “good repair standard” - and can be considered California’s minimum maintenance standard. Districts must self-certify that all their schools meet the good repair standard. The Serrano v. Priest case also speaks to the state’s role in K-12 facilities: plaintiff’s identified material inequality in school facilities as one ground supporting their successful claim that relying on local property takes to finance K-12 public education violated the California Constitution’s equal protection guarantee. Of course, Serrano shaped our current education funding system in CA, and LCFF has deep roots in the Serrano decision. 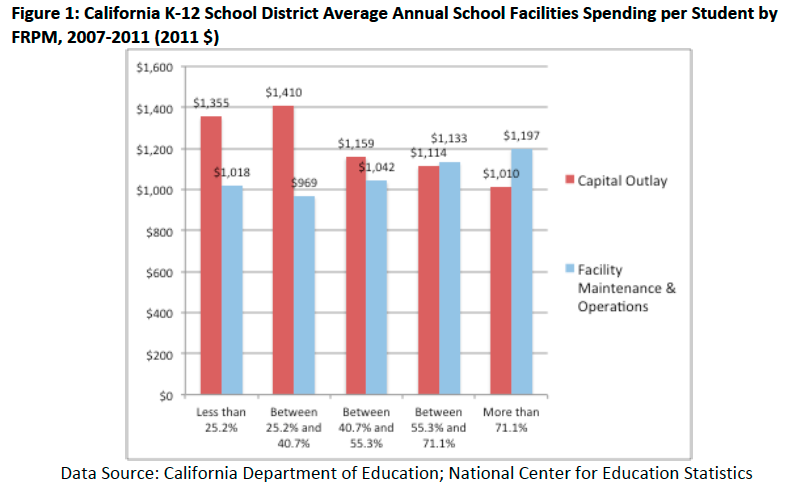 Of central concern is that leaving the responsibility for facilities capital spending at the local level will most likely perpetuate wide variation in the quality of school facilities provided for CA students, because there is wide variation in local wealth and ability to pay for school facilities expenses. Now I want to turn to the Principles that should guide this debate in the state’s funding role. In developing each principle, we analyzed available data indicators on CA school facilities – using 2007-2014 data from CDE, federal NCES and other sources. The state’s role should ensure equity in K-12 public school facility conditions and state facility funding allocations should be equitably distributed, guided by student, staff, and school needs. The state-local system of school facilities funding should enabling all students to meet state standards for academic achievement. Some schools will need more capital and/or maintenance resources than others to provide safe, healthy, and educationally adequate school facilities because their facility-related “burdens” are unique to the local context. Thus, in allocating educational facilities dollars, the state funding system should systematically account for differing school needs. 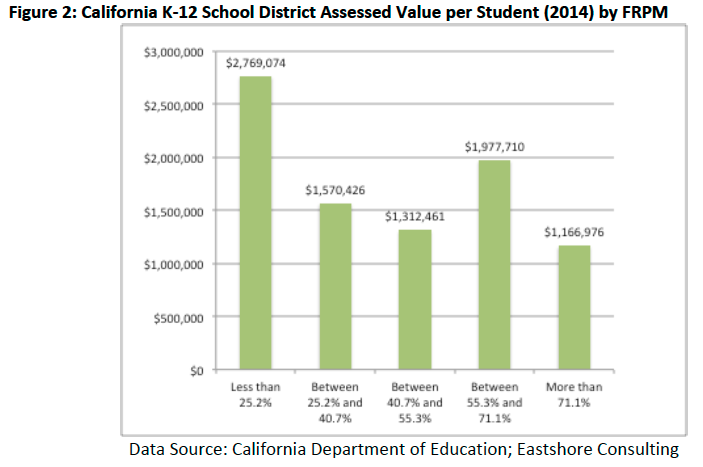 Assessed Value: Our analysis of school district Assessed Value finds that the average AV of the school districts serving the poorest students is only 42% of the average AV of the districts serving the highest wealth students. This has a direct impact on their ability to secure local bonds. Maintenance Spending: We also find that school districts serving the greatest share of higher poverty students are spending about $100-$200 per student MORE each year on facilities maintenance, than districts serving wealthier students. Because M+O typically comes out of the district General Fund, this means $100-$200 less per student spent on teachers, books, and other educational resources in higher poverty schools. While we know how much districts are spending on their facilities, this does not account for the disparities in the quality of facilities. There is currently no systematic data on the condition of our school buildings. This gap in basic information about our schools is THE huge obstacle to figuring out how to best spend state funds on school facilities. State K-12 facility allocations should incentivize responsible local planning and investment for K-12 facilities. All local communities should also be expected to make significant and good-faith efforts to adequately and responsibly plan for, invest in, maintain and operate their local school facilities in proportion to their local revenue-generating capacity. Following the LCFF/LCAP approach, local communities should decide what their local needs are through local district-wide facilities master plans that comprehensively evaluate existing conditions and future needs – state facility funds should go toward these locally prioritized projects. The state’s school facility funding system should not incentivize local communities or school districts to inadequately invest in their school facilities in the hopes that the state will then step in to remedy any facilities problems. We see wide variation in capital outlay by school districts: the top 20% of districts in spending spent more than $1,632 per student per year, while the bottom 20% spent a fraction of that amount—less than $192 per student year. State approaches should avoid punishing districts that make a greater local effort. We see wide variation in M+O spending by school districts: The top 20% of districts in spending spent more than $1,200 ($1,217) per student per year while the lowest in spending spent about less than $750 ($748) per student per year. State K-12 facility allocations should be stable in nature to promote sound local planning and investment that prioritizes health, safety, and educational suitability of learning environments. As the World Bank noted in a 1999 study of K-12 capital programs: stable funding is a hallmark best practice. Predictable state facility funds leverage many benefits for school construction: they enable accurate planning and budgeting by local school districts, lead to more confident local borrowing strategies, and will also likely bolster the confidence of local voters to support local bond measures. Predictable state funds decrease uncertainly and lower costs. State policies and funding allocation on K-12 facilities should strive to achieve adequate levels of combined state and local investment that best promote health, safety, and educational suitability. By not addressing the issue of adequate investment (whether they be state or local revenues) for K-12 facilities, the State of California takes on great risks: jeopardizing the health of occupants, accelerating depreciation of assets, deferring modernizations needed to support teachers and students in meeting high academic standards, and others. The persistence of inadequate school facility conditions in the absence of mechanisms to address systemic inequities means that some children will likely be disproportionally burdened, harming their health and/or educational achievement. Inadequate regular facilities investment (especially on maintenance) also increases facilities costs over time. Things that were maintenance needs turn into more expensive capital problems. What is the minimum investment needed statewide in our K-12 school facilities? Taking direction from the court cases noted previously, the minimum prevailing state standard is the “good repair standard” in the Education Code (17002(d)). I want to be clear: This is not the state’s tab – this would be a combination of local and state funds. Traditionally, local school districts s have been putting in about 70% of facilities expenses. But this will be a significant burden for districts if they have to go it alone, particularly for the most disadvantaged schools. State K-12 facility allocations should involve transparent and easily understood formulas and processes within the context of the complexity of school facility needs. To foster public confidence and accountability, all stakeholders should be able to [readily understand the essential elements and underlying principles of school facilities funding decisions, and can] see how and why each school district gets the funding it gets – and how those funds are spent at the local level to meet the facilities needs in each unique community. Overall, it’s pretty clear that California has a long-standing state-local partnership for funding new school construction and modernization. It also seems clear that the State has a responsibility for maintaining school facility conditions. One fundamental question, though, remains unclear: in the absence of state facility funds, will all districts be able to raise minimum necessary facility funds on their own? What strikes me about this broader debate is that by pushing funding solely to the local level, the state risks WIDENING disparities in facilities condition. In doing so, the state is going in the opposite direction of Serrano and LCFF, which have sought to remove the disparities in local funding ability.